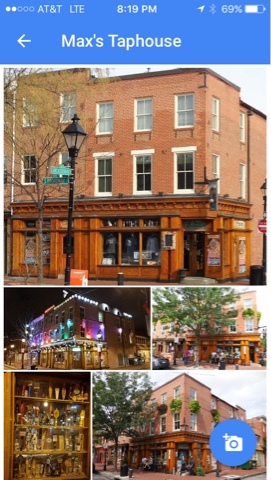 My MD son and my night out after disc golf and gormet pizza also included a stop at Max's Taphouse in the trendy Fells Point section of Baltimore. 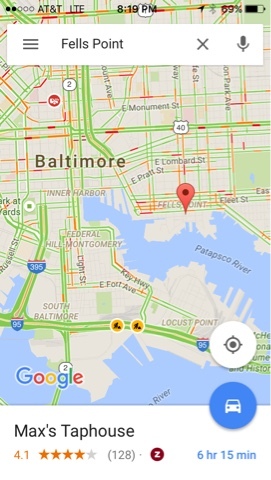 Fells Point is a short distance from the Inner Harbor Area of Baltmore and is much less touristy and a great place if you are looking to meet locals. Max's is noted for its long list of brews on tap and our stop included meeting a number of Baltimore Homebrew Club members, which my son is one. There are also many restaurants in the area too. While talking to some of my son's Homebrew friends he was talking club business. It's going to be some conference with about 50 breweries and a number of Homebrew clubs. I have not adopted home brewing but have participated brewing with my son a couple times. It's a science. Although I don't Homebrew with my son's help I now appreciate craft brews vs the high volume commercial brews that we all know. This is why I often stop at breweries on my travels and write about my experiences. I prefer lager, Pilsner, Belgium, and wheat brews but I am surprised by some IPA's when I'm not left with an after taste. After visiting with others at Max's street side tables enjoying beer it was time to head back for the night. Baltimore is a fun city to enjoy a night out, especially when you do it with your son.